Howdy programmers! 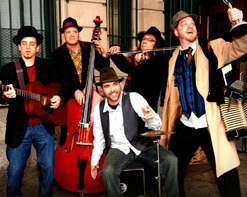 It’s Andy Gesner and the HIP Video staff, here with our 100th video of 2011, a band of Americana gypsy-funk scoundrels that will make you laugh, sing and do any ol’ thang with their heady mix of Blue-eyed Blues, dark Gypsy grooves and foot-stompin’ party tunes! The Wandering Bards use humor and some seriously groovy dance moves to seduce and insight romance in their infectious song “ImaBeTheOne.” As proud Jersey rockers, we’re thrilled to introduce this rambunctious, playful and spontaneous quintet sure to put a smile on your face. Here’s a musical anomaly that takes everything seriously; their chops, their promotional savvy, their live performance, etc. The one thing they thankfully don’t take seriously is themselves. The Star Ledger has described The Wandering Bards as a “sharp-dressing, gypsy-folk quintet fiddle and strum up a storm on amusingly proletarian subjects.” The Wandering Bards take their Americana gypsy-funk presentation rather seriously, despite their joyful take on society. The band’s sound consists of everything from banjitar, harmonica, kazoo, accordion, musical saw, jaw harp, cajon, cymbals, a tambourine banded to left foot and maracas, in addition to the guitar and bass. “ImaBeTheOne” is a confident wooing of women everywhere, as The Wandering Bards sing out lines of tongue in cheek seduction. And it’s no surprise that the song has not only attracted the target audience, but enticed the critics as well. OurStage.com, The Westfield Leader, and Vents Magazine have all picked up on The Wandering Bards, raving about their unique contribution to the music scene and their self-released new album The All-New, Good Time Monkey Puzzle Revue. The “ImaBeTheOne” video takes place in a club where the band performs head over heels moves to hopefully take home the only woman at the bar. It’s an over-the-top display of romance and showmanship in the face of conquering love. The Wandering Bards not only perform the song in perfect symphony, with groin thrusting moves and all, but also introduce several synchronized dancing routines. The entire thing is not only a tongue in cheek hilarious romp, but turns out to be wildly entertaining. Bands have always thrived on the concept of performing live, and after seeing this clip, there is no viewer in the logical universe that will want to deny him or herself the pleasure of seeing this group in person. We are stoked to bring you this talented group of Garden State musicians and hope you will join us in celebrating this sensational and riotous clip that every viewer will certainly want to shake their money maker to. We would love to hook you up with some copies of The All-New, Good Time Monkey Puzzle Revue, so please be in touch and let us know of any giveaways and contests you’d like to run. If you need more info, call Andy Gesner at 732-613-1779 or e-mail us at info@HIPVideoPromo.com. You can also visit www.WanderingBards.com to find out more about The Wandering Bards.